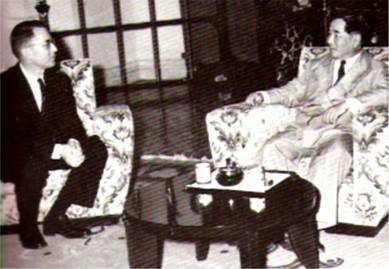 Willam Colby (left) and Ngo Dinh Diem - Saigon 1963. Colby had got rid of a lot of guys in the clandestine service at CIA. I'd talked to ex-CIA officers who hated his guts. Even Lou Conein, one of the best-known CIA operatives in Vietnam, told me he believed Colby had destroyed the agency. And Conein, who knew Colby for many years, liked him. Colby had enemies coming from the Right and the Left. Sheriff Davis admitted that it was not an open and shut case. "There is always that window open," he said, "because there were no witnesses." I continued on to Colby's house. 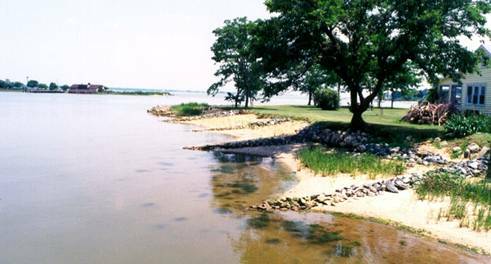 It was on Hill Road which was technically in Rock Point, Maryland, but Cobb Island, right across Neale Sound, was where Colby kept his sailboat and shopped. 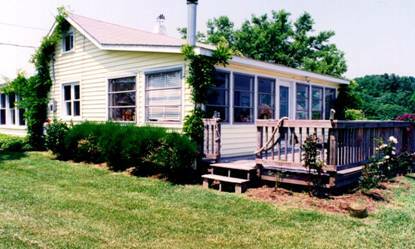 Colby's home on Hill Road, Rock Point MD. The glassed-in porch facing the front was where he took his last meal. Colby’s home was a turn of the century oysterman's cottage. It had two bedrooms and a small kitchen with a breakfast table. The sunroom, which was glassed in, was originally the porch. Since it offered a spectacular view of the water, the sunroom also served as the dining room. 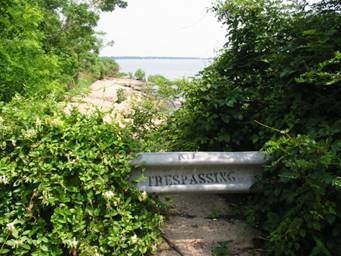 Cobb Island and his home was pure Colby--unpretentious, tranquil, anonymous. Colby's house (right) was on a spit of land. Anyone looking with binoculars from the other side of Neale Sound could see what was going on outside his home. As I drove up I saw a workman gassing a tractor-lawn mower--Joseph "Carroll" Wise, Colby's gardener and caretaker. Wise was the last known person to talk to Colby. 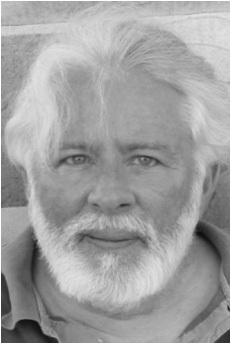 Wise, who had grizzled gray hair, tattoos on both arms, and a protruding beer belly, spoke quietly. It was about 7:15 p.m. on Saturday, April 27, 1996, when Wise drove to Colby's home with his sister. Colby was standing at the edge of his yard, near the front pier, watering a willow tree. Colby wore a red windbreaker, khaki slacks, and loafers. When Colby saw them coming, he said, "Carroll, you've got a new car." "No, that's my sister's van," Wise said. "That's why I've dropped by. I'd like to introduce you." Based on what he knew about gardening at Colby's house, Wise told me that Colby probably wouldn't have got to his canoe before 8 p.m., even if he had not stopped to have dinner. He was watering his trees and that took a long time. He was scheduled to return to Washington the next day, Sunday. Colby's next-door neighbors, Clyde Stokes and his wife Alice, saw Colby through their window when Wise and his sister were visiting. So Colby was firmly pegged for this time: 7:15 p.m., Saturday, April 27, 1996. Carroll Wise and Clyde Stokes remarked on Bill Colby's meticulous routine. He always collected his yellow hose after watering the lawn. He took it to a box where it was stored and neatly arranged it in a lasso-like circle. When Colby went boating, he took an aluminum ladder out of a shed and leaned the ladder in the water against the pier to reach the canoe. When he returned from canoeing, he removed the ladder and put it back in the shed. Colby was raised in a military family where everything had its place. Clyde Stokes was skeptical that Colby had gone out canoeing that late. "Colby was brave but prudent," he said. Stokes remembered that the wind was up and the water was choppy the night Colby supposedly went out. Stokes and his wife heard nothing because they were looking at TV. Stokes was an ex-navy man with tattoos, and I was struck by his use of the word "prudent." There was no contradiction between taking chances and being prudent. Colby was very brave, he’d parachuted into Europe during World War II for the OSS, and in Vietnam he was always ready to put it on the line. But I believed Colby was prudent, too. Above all, he was not an impulsive man, someone who would tell his wife he was tired and headed to bed--and then decide to go canoeing an hour later at nightfall. 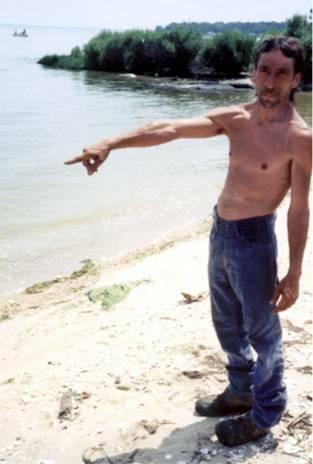 Mark Davis worked at the Portside Marina on Cobb Island, almost directly across Neale Sound from Colby's house. 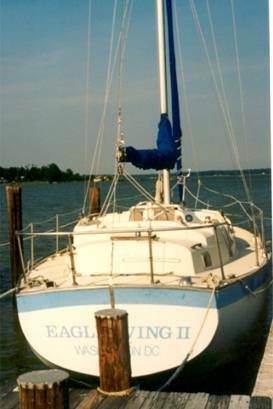 Colby kept his 37-foot sloop, Eagle Wing II, at the marina. Davis was impressed by how hard Colby worked on his boat that Saturday. He was at the marina from 11 a.m. until 5:30 p.m., Davis said. Others did not agree on the time, maybe there was a half-hour’s difference either way. 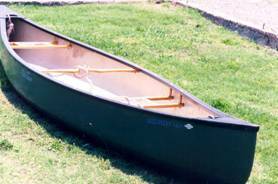 Colby's canoe. It was filled with so much sand that Kevin Akers was suspicious. On Sunday afternoon Alice Stokes, Colby's next-door neighbor, kept peering out the window. Colby's red Fiat was parked near the house. The boat was gone. The ladder was still in the water. And she hadn’t seen Colby all day long. It was the ladder that finally pushed Alice Stokes to call 911. Colby would never leave his ladder in the water if he had returned. Sharon Walsh reported: "The scene was preserved as well as possible." Later, Detective Joseph Goldsmith, the assigned investigator, corrected several errors Walsh made in her report. There was another suspicious point. On the kitchen table was his black leather wallet. It contained $296 (14 twenties and 16 ones), a comb, a file, and various membership and credit cards, a driver's license. There was also a silver key ring with five keys. When Colby was found, his pockets were empty, no identification at all. Alice Stokes phoned Sally Shelton Colby in Houston. Policewoman Sharon Walsh asked to speak to her. Walsh reported: "Ms. Shelton was inquisitive yet calm. She stated she was 'numb.'" I talked to Lt Mark Sanders of the Maryland Natural Resources Police. He was chief of the search effort. Drowning accidents were common around Cobb Island. The searchers were practiced and knew what they were doing. Yet even working 24 hours a day, they couldn't find his body. "Claude," I said. "The sun sets at 7:57 p.m. Colby enters his house about that time and presumably begins to prepare dinner. How long does it take him?" "Oh, Colby is seventy-six," Claude said. "He's not going to be moving around very fast. He's going to steam the clams, boil the corn, open a bottle of wine. You say he laid down a place mat in the sunroom facing the water?" "That means he is not in a hurry," Claude said. "Otherwise he would eat at the kitchen table. So we're talking about 20 to 30 minutes." him is where Colby's body was found 9 days later. 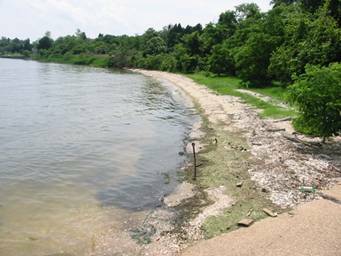 Colby's body was found at the edge of the shore near the crumbling concrete pier in the foreground, about a three-minutes’ walk from the road. Smialek could tell I'd talked to medical examiners before. And he doubtless perceived what I was thinking: Medical examiners often knew only one thing for certain--that the decedent was dead. Everything else, except for the standard toxicology tests, was informed guesswork. The Maryland state medical examiner's office had, in effect, shut down the media circus that surrounded Colby's disappearance. Scores of journalists had staked out his home with satellite trucks, the whole works, for the first week after he disappeared. "Can I see the autopsy report?" “It's not ready yet,” he said. "Not ready?” I said, surprised. “The Colby case is pretty famous. You did the autopsy on May 6, 1996, exactly a month ago. And you haven't got around to finishing the report?" “We'll fax it to you tomorrow,” he said. "Hey, something doesn't seem right," I said. "I've seen a lot of drowning victims. But Colby hardly looks dead. He's not bloated a bit." "Yes, Mr. Colby's body looked very well preserved, even though it was clear that the body was decomposed and discolored," Smialek said into my tape recorder. "He looked remarkably well." "I interpret that to mean the water was of a sufficiently low temperature that prevented the body from developing the type of gas decomposition that we commonly see with drowning victims when they've been in the water for an extended period." The autopsy report said Colby appeared in surprisingly good shape for a man of his age. But the gist of the report came down to the last paragraph. The paragraph was titled: "Opinion." "This 76-year-old white male, William E. Colby, died of drowning and hypothermia associated with arteriosclerotic cardiovascular disease. He was found floating in an advanced state of decomposition nine days after being reported missing. Identity was confirmed by dental examination. He had severe calcified atherosclerosis which would predispose him to a stroke or heart attack. Decomposition, however, will lyse (dissolve) clots and the fatty material in atheroma. It is likely he suffered a complication of this atherosclerosis which precipitated him into the cold water in a debilitated state and he succumbed to the effects of hypothermia and drowned. The contents of his stomach are consistent with his last reported meal and indicate his death was shortly after his dinner. The manner of death is ACCIDENT. The deceased had been consuming alcoholic beverages prior to death." No. Apparently the family did. Apparently they had some type of phone system where any long distance calls are billed back to their regular Washington phone. In fact, they used a code so you couldn't even call out unless you knew the code. Some of the family members who weren't familiar with that, when they got down here, had difficulty using the set-up. After that time period, seven or seven fifteen, there were no calls made out [from 301-259-2905] that we are aware of. Of course there is no guarantee. Somebody could have used that line and made a local call and we don't know about it. I don't have that down. I know you've gone over your conversation with your husband, and I hate to ask you to go over it again. But would you? He called, uh-huh. We spoke everyday, at least once a day. Both of us were traveling a lot. He said he had just--normally it takes two days to get the Eagle Wing ready for the summer. But he'd compressed it into one day, so he'd worked very hard. And he'd had a wonderful time, and he said he was tired. He had stopped and picked up some clams and he said he was going to have the clams, which was his favorite dish. Then he was going to take a hot shower and go to bed. If it's important. I can tell you it was right at six o'clock [Houston time—7 p.m. Washington] when he called me. My mother had just walked in and I was looking at the news. I can check if you'd like. I don't have time to do it before I leave on Friday. Uh-huh, sure, I'll do it. Just as I’d thought, the killers didn’t make many mistakes. The first was unavoidable—Kevin Akers--but with luck they got away with it. I’d say there were from three to five of them. Two on a boat, maybe two or three who went to his house in a car around 8:30 p.m., at nightfall. The two in the car made Colby empty his pockets so if they were stopped he would have no ID to back up his claim that he was an ex-CIA director and these thugs were officers he’d fired. One of the men put the ladder in the water and took the life jacket. Then they drove to the end of Rock Point Road to rendezvous with the boat.